Sigrid is the popstar you've been searching for. She might be from a small town in Norway, but she has a mind, attitude and voice bigger than any other 21-year-old. With a silky-gravel to her Norwegian accent and a smile that often opens into fits of laughter, she personifies 'cool' but doesn't know it yet, and has the world as excited as when Lorde first appeared with Royals. Born and raised in Ålesund, surrounded by sea and mountains, it was as if Sigrid was always fated to drive the ten minutes across to the neighbouring island of Giske and make musical magic in the idyllic Ocean Sound Recordings. The past twelve months have been nothing short of extraordinary. Sigrid's debut EP Don't Kill My Vibe was hailed as one of the biggest breakouts of 2017, and was soon followed by the certified silver-selling Strangersand 2018's stripped back and vulnerable single, Raw. She has sold out shows across the world, performed at the 2017 Nobel Peace Prize concert as well as live on Later With Jools Holland, The Graham Norton Show and The Late Late Show with James Corden to huge acclaim, and won the much coveted BBC Sound of 2018 poll. With Neil Young's biggest fan for a father and a mother with a deep-rooted love of Joni Mitchell, the importance of great songwriting was instilled in Sigrid from the start, her piano lessons charting a path from the tender age of seven. In her early teens she discovered the likes of Coldplay and Adele, and began learning covers before ultimately deciding she'd rather deconstruct the songs; taking parts from here and there, changing the chords and rhythms, and piecing them back together as her own creations. When Sigrid was 16, her older brother Tellef, also a musician, had a show coming up and with two weeks notice he invited her to open for him -- so long as she wrote some original material. Cue Sun, some vocal guidance from her older sister, a successful first performance, and she was soon recording the song at OSR, using session time earned by her choir in exchange for assisting at the studio's annual festival. Her brother suggested she submit the track to Norway's version of BBC Introducing and not only was it was picked up, but she was soon announced as their artist to watch. The first song she had ever written resulted in phone calls from managers and labels, and if she's honest (she is), she was a little overwhelmed. 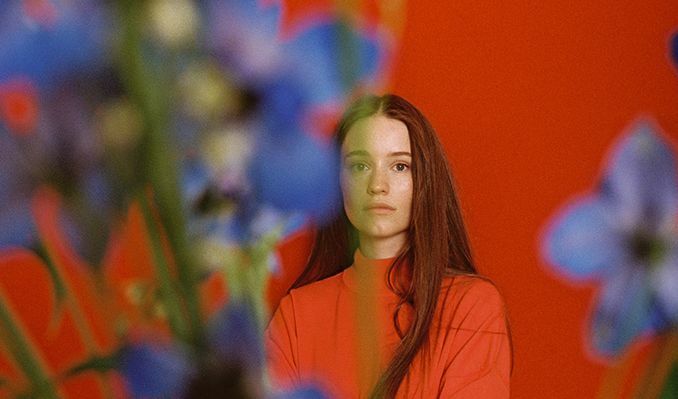 Sigrid was snapped up by Norwegian indie label Petroleum, also home to her friend Aurora and attempted to juggle school and music for a while. "It was just so hard to find time for things. I couldn't do shows. I couldn't do promo. I had a history test to revise for!." Her third single with them was immediately playlisted on national radio, but she needed time to figure out what she wanted to do and eventually, at 18 -- just three years ago -- she moved further down the West coast to Bergen where she found herself a part of its burgeoning music scene. Fast forward to Sigrid signing to Island Records in September 2016 and launching Don't Kill My Vibe in February 2017, the pop star now splits her time between Bergen and the back of a tour van. She still counts the music she was raised on as her main influence and is occupying a wonderful space somewhere between the slightly leftfield pop of Danish singer MØ and the butterfly-inducing something special of a young Adele. "I guess the key thing that's always inspired me is really well written pop songs," she decides. "Playing piano and singing whatever comes naturally is the best thing for me." Sigrid's debut single Don't Kill My Vibe was written after she was put in a difficult writing session with some older men who, well, killed her vibe. "They made me feel like I was in the way. I totally got that they might not be excited to work with me, but they didn't have to be rude!" she explains. "I wish I had just told them, but in that moment I chose to back away and write about it later on." Thank god she did, because the result is a completely addictive pop banger produced by Martin Sjølie, full of playful melodies, a huge chorus and the perfect dose of "hey!" The Don't Kill My Vibe EP, released last May, was a window into what was to come from the precocious popstar. All very much autobiographical, the record featured the just as impressive Fake Friends -- also produced by Sjølie and as empowering as the lead -- and Dynamite, a powerful and heartstring-tugging ballad (she can do those too -- really well) about juggling work and private life. Plot Twist, meanwhile, is about a guy who played a role in her love life. With dynamic range and impressive control, her vocals reach powerful raspy heights with flashes of Hometown Glory-era Adele throughout. Sigrid was the talk of the festival season last year, storming the stages of SXSW, The Great Escape, Roskilde, Glastonbury, Latitude, Iceland Airwaves, Pitchfork Paris, Øya and more with her band, who also happen to be her best friends. On 14 March 2018, as part of a sold-out tour of the UK, she played the iconic Shepherd's Bush Empire and became so overwhelmed with emotion that she started crying on stage -- so much so that the audience sang the whole opening verse of Don't Kill My Vibe without her, hitting every note. "That was really special," she says. "I just had difficulties holding it back. It was just very emotional because it felt like such a magical show." In the summer of 2018, she'll be gracing Coachella with her presence before heading off on a U.S. tour and eventually returning to London to headline Somerset House in July -- her show sold out before anybody else's, naturally. It's no surprise that Sigrid has become renowned for her live performances; with an abundance of idiosyncratic energy -- the synergy between the band and Sigrid is mature beyond their years. "I like the challenge," she laughs. "People sometimes stand with their arms crossed and if I can get them to move then I've won." A point is often made of Sigrid's casual stage uniform of jeans and a plain white t-shirt, but she doesn't see what all the fuss is about. "I'm just doing what all the male rock stars have done forever," she points out. "I don't think it's special or unique -- it's just my everyday work outfit! I feel very liberated in jeans, I can dance in them." Sigrid's Raw EP shows, she says, "not a different side, but a side of my music that maybe hasn't had that much light on it before. The first EP was quite powerful but this one is a bit mellow and I really, really like it. There are definitely some proper tunes." She spells out her longstanding message of staying true to yourself on the title track, and the accompanying video reinforces this further. It's a live version, with a slight twist, that shows the everyday magic of being on tour. "I feel very lucky because I'm having a great time. You've got to enjoy it, or what's the point?" Reflecting on her previous ambitions, Sigrid's dreams of getting a song on the soundtrack of The Sims (she's a massive fan) and meeting a kangaroo (her Australian tour earlier this year sorted that out) have already come true. And at the rate her career is unfolding, she's going to have to think much bigger than that. Fans will have to wait until later this year for the all-important first album, but their idol is in no rush to finish it. "It's very important to me that everything I release says something. I'm constantly writing. You can look at the music as numbers, but it's when you see people's faces in the crowd and they're singing back to you and having a good time then it means something," she says. "I've seen groups of girls singing and crying along to Dynamite together, so to see that your songs can mean something to a group of friends, it makes me feel like I'm doing something right." With all the continent hopping she's doing these days, Sigrid can't help but look back to that island, "I think my new dream is to buy a house on Giske and live there with my cat. Seriously, it would be so cool to invite people over to write music and then bike over to the studio together to record it." But until then, she's got an arsenal of intelligent, meaningful pop tunes to share with the world, and a big plan. "My big master plan is to love writing music for the rest of my life; to keep that nerve and make music that means something to me."